I wrote about author and illustrator Margaret Merry over at 5 Minutes for Books. One thing I mentioned was that she is a gifted artist. I love looking at the pictures which compliment her stories. 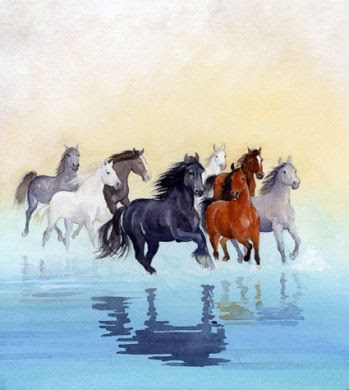 I'm not personally a big fan of horses, but I love looking at her paintings. There is a beauty and a rhythm to them that you just relax into. Her stories are also calm and peaceful and are just all-around enjoyable to read. 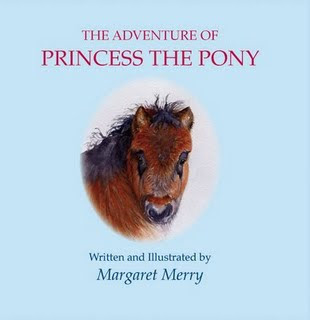 To learn more about Ms. Merry and her books, visit the Margaret Merry website. And then, just enjoy! HOW do I not have THAT book????? I can't just put it on the list I have to OWN it! NOW! Wow! That is an amazing book! 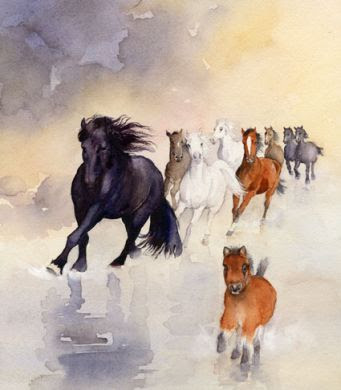 The illustrations an beautiful!!! Looks like she used water color too! Now that's talent! I am going to have to find her books! This book by Micheal Landon looks good, is it? Have a great monday! !